The Garden Today The Porter's Garden covers part of the site of an earlier garden belonging to the Porter's Lodge, which was constructed in 1708 and is the oldest building in the Dockyard. It is the white building opposite the Visitor Centre at Victory Gate. Over the years parts of the garden were built on and paved over until by the end of the last century nothing of it remained. 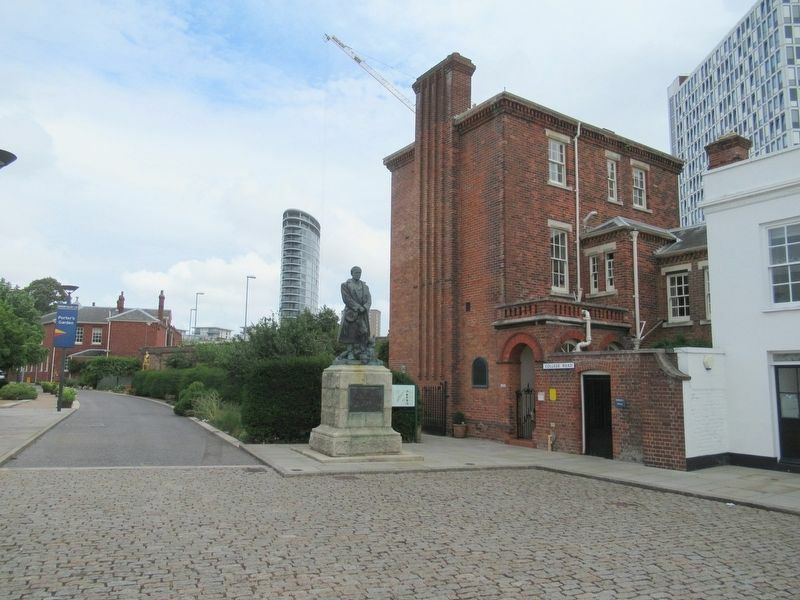 As part of the Renaissance of Portsmouth Harbour Millennium Scheme, a project part-funded by the Millennium Commission, the site was cleared and the present garden laid out during 1999-2000. 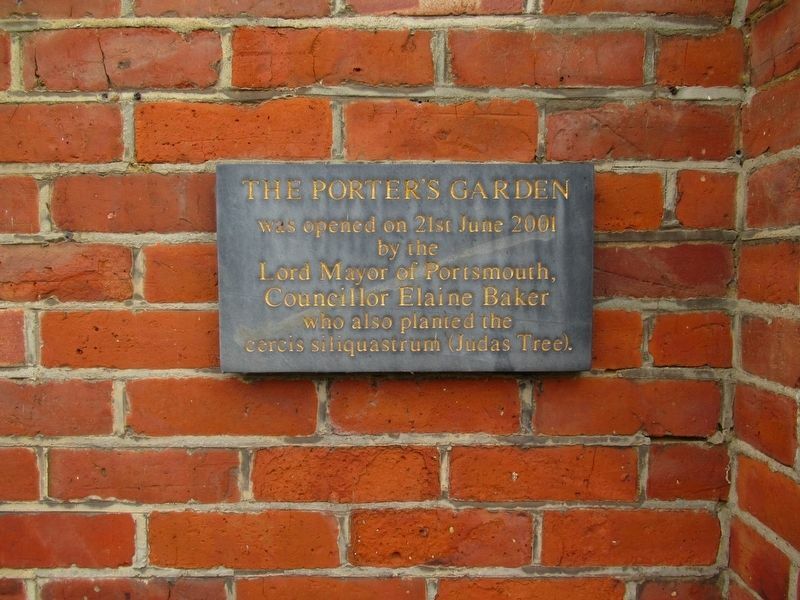 A voluntary group, the Friends of the Porter's Garden, planned and planted the new garden and in June 2001 it was formally opened by the Lord Mayor of Portsmouth. 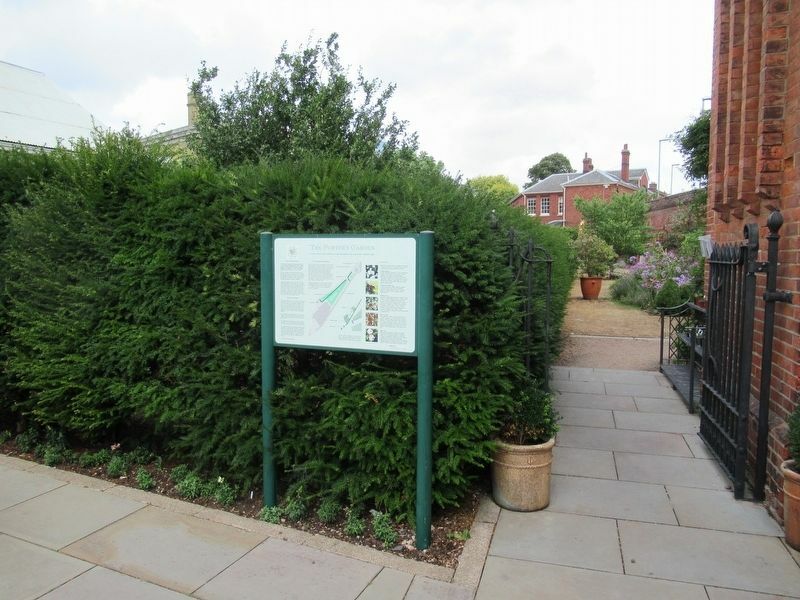 Main features include yew and box hedging, Morello cherry trees along the Dockyard wall and, on the other side of the road, four walnut trees. Flower beds follow the principles of 18th Century design, with exotic and useful plants commemorating voyages of naval exploration, and medicinal herbs for everyday ailments linking the garden to Mary Rose and HMS Victory. Interest There are two statues in the garden. At the western end looking towards the harbour stands Captain Robert Falcon Scott with his dog, sculpted by Kathleen, Lady Scott, in 1915. The gilded statue at the eastern end of the garden is King William III finished in the manner of the Caesars' by the sculptor Van Ost. William's wars against Louis XIV led to the expansion of Portsmouth Dockyard in the 1690s, and he was also an enthusiastic Gardener. Beyond William and the potting shed is the rock found lodged in the hull of HMS Pique which ran aground in Labrador but successfully crossed the Atlantic to return home in 1835. The dockyard wall, which defines the Porter's garden, was built in 1711, so that ‘Ill disposed people inclineing to Purloine, are shut out from doing hurt from the Land’. The wrought iron gates were specially commissioned for the garden and were designed and made by local blacksmith, Peter Clutterbuck. The granite and iroko seats were made by Salisbury-based sculptor Roger Stephens, using granite slabs salvaged from the old dockyard cart tracks. This work was funded by a grant from the Onyx Environmental Trust under the Landfill Tax Credit Scheme. and outside the dockyard. He had three main duties. He guarded the dockyard boundaries and property and marked working hours by ringing the muster bell and closing the gate against latecomers. He prevented excessive theft of timber supplies by allowing ‘no Person to pass out of the Dock Gates with great Coats, large Trousers or any other outer dress that can conceal stores of any kind’. He also sold beer to dockyardmen ‘to enable them the better to carry on their labour and not to distemper them’. Dockyard shipwrights and house carpenters worked on outside projects such as St George's Chapel, built in 1753. William Woodrow (Porter, 1739-80), described as a 'Gentleman' owned one of the larger ground floor pews costing £30. Planting Many of the perennial plants that bloomed in the garden in 2004 are listed. They are complemented in the beds by historically appropriate annuals and biennials. The marker is behind the statue of Captain Robert Falcon Scott. Like many private residences in the Dockyard, the Porter’s Lodge had a substantial garden in which to cultivate vegetables, fruit and flowers. This plan of 1754 shows the house, stables and two small trees. Location. 50° 47.949′ N, 1° 6.429′ W. Marker is in Portsmouth, England, in Hampshire County. Marker can be reached from the intersection of Queen Street and Wickham Street, on the left when traveling north. Touch for map. Located in Portsmouth Historic Dockyard. Marker is in this post office area: Portsmouth, England PO1 3LR, United Kingdom. Touch for directions. Other nearby markers. At least 8 other markers are within walking distance of this marker. Captain Robert Falcon Scott (here, next to this marker); The Jutland Gun (a few steps from this marker); The Ship Anson (within shouting distance of this marker); Mudlarks (within shouting distance of this marker); The Hard (within shouting distance of this marker); Beware of the Wolf (about 120 meters away, measured in a direct line); The Figurehead (about 120 meters away); The First Black Battleship (about 120 meters away). Touch for a list and map of all markers in Portsmouth. More. 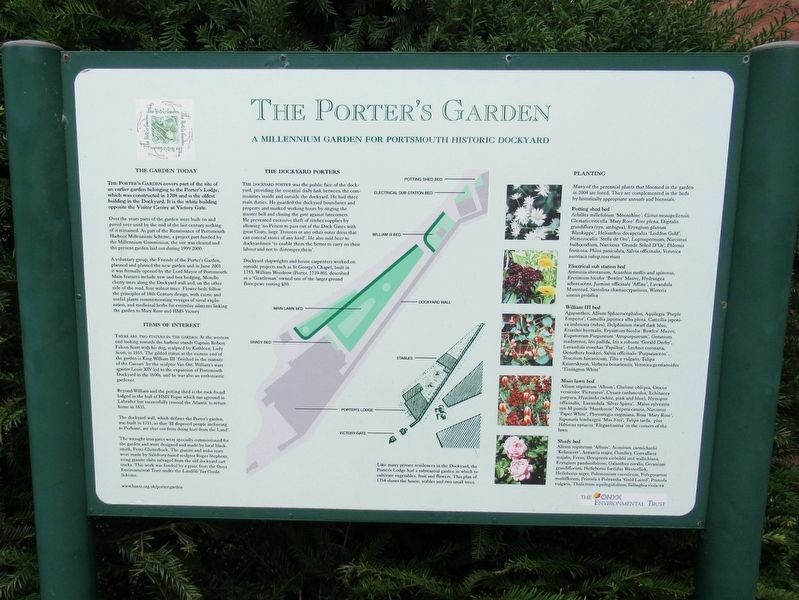 Search the internet for The Porter’s Garden. Credits. This page was last revised on March 22, 2019. This page originally submitted on March 22, 2019, by Michael Herrick of Southbury, Connecticut. This page has been viewed 31 times since then. Photos: 1, 2, 3, 4. submitted on March 22, 2019, by Michael Herrick of Southbury, Connecticut.